Old store building at Oil Trough AR. Somewhat the worse for wear, but hanging on. 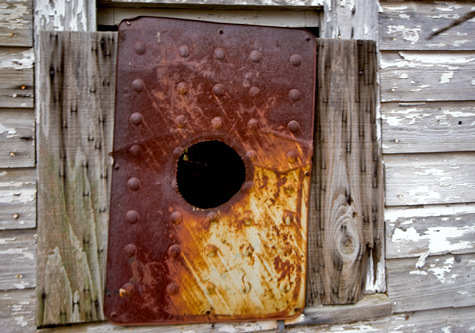 The story of this old store building at Oil Trough AR started on the Photo of the Week page at corndancer.com. Check it out. There were thousands of local stores like this which did not make the cut when times changed and or business conditions became, shall we say, rough. Although some may consider the old building to be an eyesore, I believe there are legions of those, who like myself, consider the old structures like this to be rough-edged treasures, serving to remind us of our past. Even in micro environments, there is value to knowing from whence you came, one would think. This lone tree stands as a memorial to Frank Cross who was murdered in the mid-eighties. This story started on the Photo of the Week Page at corndancer.com Click on the link to see the first part of the story, a very cool thing to do. Frank Cross, an invalid confined to his bed, was murdered in the mid-eighties at his home which formerly stood behind the tree. 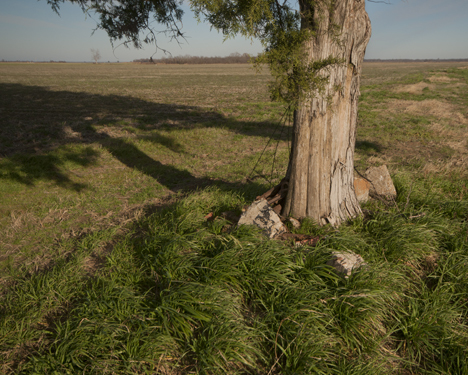 The family had the house demolished, but left the fine cedar tree standing as a memorial to Frank, who was an admired member of his community in southeast Arkansas. Close inspection of the tree base reveals some artifacts which were probably part and parcel of the old home. Apparently, some items and materials which were not removed during the house demolition were left under the tree.This also included a wire wreath holder. Items left under the tree appear to include part of an andiron, which, we presume, was almost certainly used in a fireplace in the old Cross home. Note in the picture above how flat the grass is laying. The wind was whipping across the Delta fields in the 15 knot neighborhood. It was December 21, the alleged first day of winter. As if programmed to be true, the temperature was below 30 degrees in that afternoon. The wind chill factor was polar. In the picture to the left, you see items left under the tree. For the uninitiated, the piece with the spring attached appears to be part of a cultivator, a tractor towed implement. 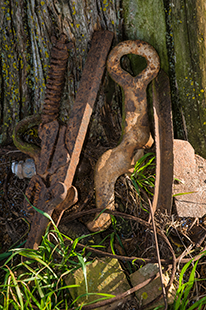 The object to the right of the cultivator part is probably part of an andiron set. There are some bricks in the foreground, probably from the house. Human nature being what it is, there was other detritus, probably not a part of the household leftovers. It seems that we humans have some sort of genetic bent to deposit trash where we find other (perceived) trash. There was an old hydraulic hose, some water valve parts and other bits and pieces, not endemic to a house which was probably 75 or 80 years old, when it met its demise. Also a few wrappers and bottles. It does not take a rocket scientist to figure out how those got there. In the hot summer, this tree provides best shade for miles, a good place for working people to take a break. Click here to see nine additional pictures of the tree. Mother Nature has assigned tree guard duty to some of her pesky critters, to wit: a Yellowjacket nest in the tree. Interlopers beware. Why does the barn have walls and doors cut at angles? The story started on the Photo of the Week page at Corndancedot com. If you want to see the first picture and get the first part of the story, a cool thing to do, click here or on the link above. This old structure is on McKinney Road, south of Sherrill AR. It has been there a long time. In fact, in a former life, as I explained last week, I passed the structure frequently. The unusual construction never registered on me until, years later (now), I was looking for something to shoot and write about. The barn with angled doors and walls, so to speak, begs the question, why did the builder do this? Is it functional or is it decorative? Inquiring minds want to know. The rusted diesel tank stands guard to the barn. Notice the notch cut at the top of the back door. Someone wanted something tall to be inside. A combine perhaps? The notch on the back entrance adds to the mystery. Probably it was added after the building had been in use for a while. A taller new piece of equipment necessitated the notch. Now we wonder what was it? Inside the structure I found one of the supporting columns had been notched. In the photo below, look at the bottom of the column to the right and you can see a slight indentation. Inside the barn, you see typical construction. Take a look at the bottom of the right hand column to see a notch. See the picture below for a closeup of the notch. Someone assaulted the column with an axe or hatchet. Temper tantrum something useful? The mystery multiplies. Did someone try to chop the the column down? Why? Definitely uncool if you succeed. The crashing results might overwhelm the tensile strength of certain skeletal components. Was someone making some adjustments to facilitate parking an implement with a weird protuberance? Whoever did the deed, probably broke a good sweat. When I say that, WHO is the operative word. If it was WHAT, from the teeth marks he or she left, I want nothing to do with it. I do not purport to be a forensic firearm authority. However, most people from these parts with one eye and half sense will probably agree with me that the holes you see above came from shot gun pellets. Definitely big enough to do some serious damage to bodily components. Thanks for dropping by. We hope you enjoy these posts. Thousands of geese object to my presence by taking to the air. They are south of Sherrill AR. We’re taking a look at Snow Geese in Arkansas. The story started on Corndancer Dot Com’s picture of the week page. If you want to check out the beginnings of this tale, a very cool thing to do, click here. The numbers of geese here in the midsouth are staggering. This is probably a medium sized flock. The larger ones can go upwards to hundreds of thousands of geese. Geese, unlike ducks, prefer sloppy, muddy locations, with an apparent preference for soybean fields. I say this, having observed a lot of geese so located. If there is scientific evidence to the contrary, I stand corrected. Mostly snow and blue geese in and above a "buckshot" field near Sherrill AR. This particular field was composed of “buckshot” or “gumbo,” two terms used to describe the most onery dirt on the planet. When this dark umber soil is dry, it is as hard as a brick. When it is wet, it is a gooey, slimey, sticky mess, the nature of which one would expect to encounter in the worst, over the top, “ooze” horror flick. When you walk on wet buckshot, your size 12s become size 32 extra wides after a few steps. That is if you manage to lift your feet from the sticky mess. You also become taller. I need this condition like Andy Rooney needs more eyebrows. I say all this, because if you expect to shoot the geese in a rise and/or in the air, you must walk toward them. Otherwise they will, for the most part, sit and look at you and continue to honk, eat and defecate, not necessarily in that order. As I walked to get the above shot, I missed the biggest part of the “rise,” because the gumbo soil was trying to eat my left shoe. I was trying to extricate by lower extremity with one hand and shoot with the other, else I would have wound up face down in the slime. To make matters worse, the geese had been there before me, if you get my drift. I managed to slog out of the field, then removed my now 10 pound each shoes, and pitch them in the bed of the truck. I drove home in my sock feet. It took two applications of quarters at a car wash to get the shoes clean. The car wash drain may never be the same. The mystery barn. Why the diagonal cut walls? I know a guy who lives nearby. I'll find out. On the way home, I encountered this barn. I’ve driven by it at least a jillion times. In a former life, my livelihood required that I be in the neighborhood frequently. It finally dawned on me that the door is awkwardly shaped, or the walls are cut diagonally, or perhaps all of the above. Inquiring minds, at least this one, want to know why. As luck would have it, a friend of mine lives close by. Certainly, surely, he can explain. Stay tuned next week. 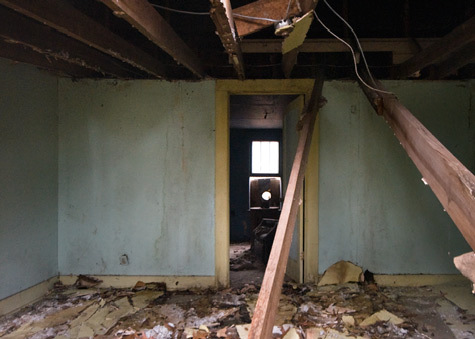 We’re looking at an abandoned and deteriorating house. The story started on Corndancer Dot Com’s photo of the week page. If you want to see the first part of the story, a cool thing to do, click here. 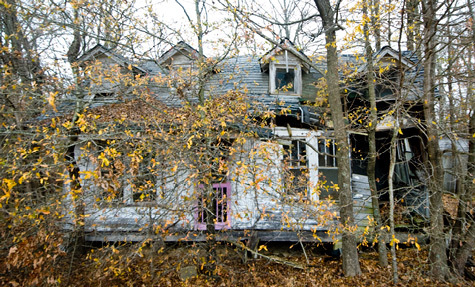 Looking at the house, near Beulah, Arkansas on state highway 33, you can see a wave in the roof and an obliterated corner. The house with four front gables was, one would presume, a point of pride for its owner. The right hand side of the house probably will not survive this winter. 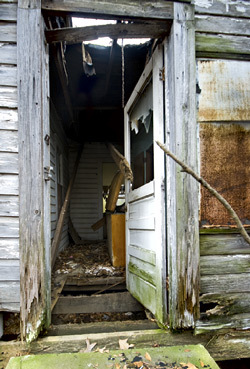 Like many rural southern homes, this one had “add-ons.” Looking in the side door, one can see a former exterior wall on the left and in the foreground. Additions were normally made to the sides or back of the house. The exterior wall apparently enclosed a back porch. Homeowners either did not want to be closer to the road or spoil the front appearance of their home. This door was probably the first to be vandalized, I suspect the door glass was broken by human hand and not by the forces of nature. The house was heated with wood. Just to the left of the back door is a side window through which the flue for a wood heater ran. The metal flange is homemade and began its life as something other than a window flange for a wood heater flue. But it was the right size and available. It appears that the hole through which the flue ran was made with using a cutting torch, a common tool in agricultural environments. The exhaust flue for the wood fired heater in the house passed through this homemade metal flange. The old heater is still in the house, as seen in the picture below. I looked through the hole in the window flange and saw the old stove still in the room. A rusty remnant of the elbow by which the exhaust flue attached to the stove is still in attached to the stove. The stove is not the venerable and virtually indestructible cast-iron potbelly variety, but is a cheaper sheet metal stove. 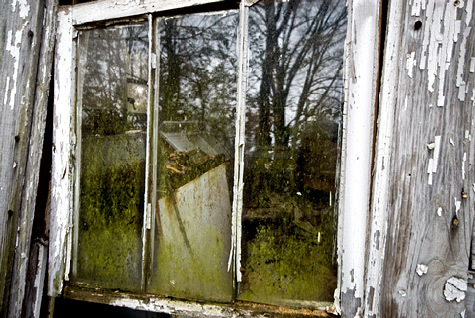 The hole in the window flange let the camera look into the room (below). 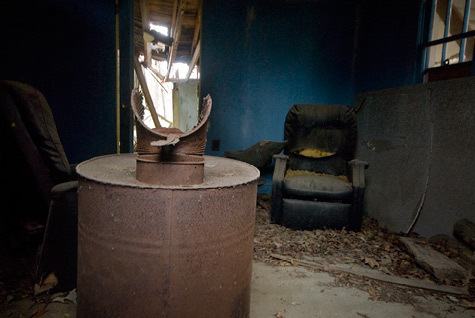 I put my camera through the flue hole in the window to shoot the stove and rusted out elbow. The window to the right opens to the enclosed back porch. A couple of unused sticks of stove wood are among the litter on the floor. Why did they leave the recliners? Looking at the room with the stove from a window on the other side of the house, you can see more details of how the setup worked. The walls of this room are finished in the puke green color popular in the early 60s. Exposed wiring shows the house was built after romex became the standard for residential and commercial electric service wiring over the two conductor and ceramic insulator method common to many older structures. Through a dirty kitchen window, you can see the kitchen sink falling from the wall.